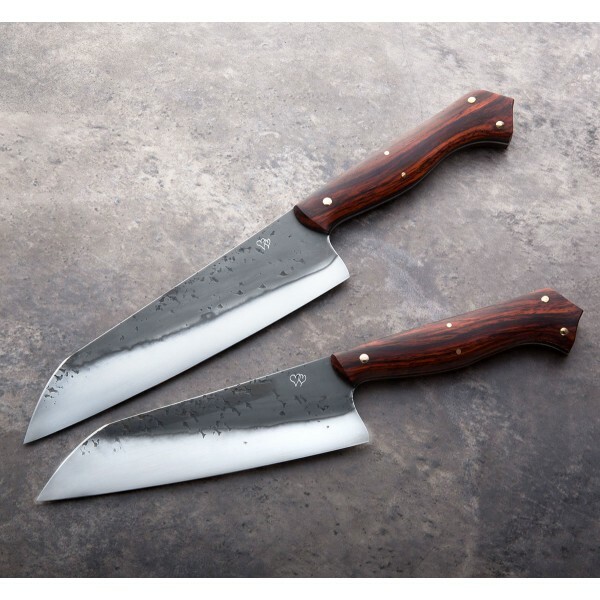 Engraved with interlocking hearts, this stunning pair of chef knives by Don Carlos Andrade features matching handles in old-growth cocobolo and forged-to-shape 1095 carbon blades. Etched and polished to show the differential heat treatment, the blades measure 185mm / 7.28" and 163mm / 6.42 with rounded and polished spines and choils. 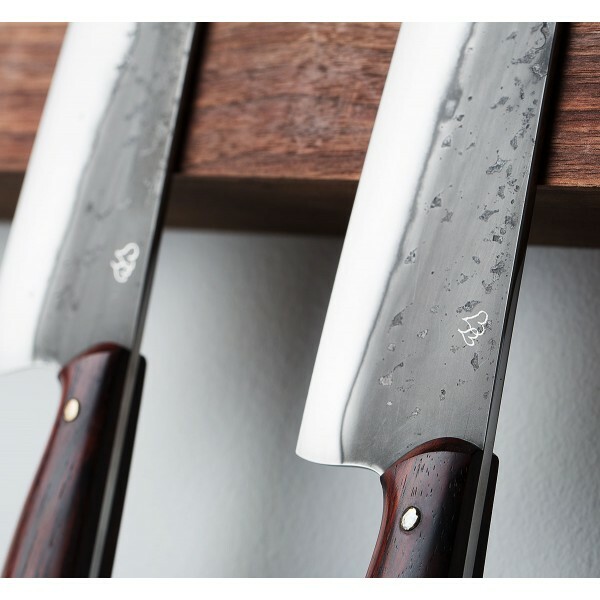 Each knife balances beautifully where the handle meets the blade, the cocobolo carved for ultimate comfort and gorgeous aesthetic, held in place with bronze pins. Built for daily use and designed to turn heads, a one-of-a-kind pair to make any couple swoon. Cloth covered protective cases are included. 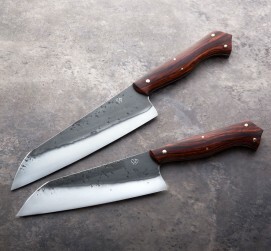 LARGE / SMALL: Blade: 185mm / 163mm. 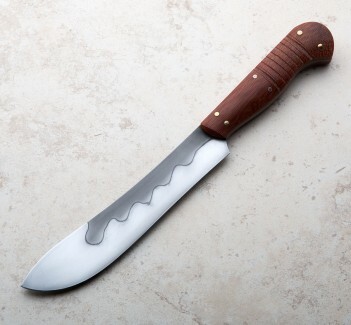 Overall length: 315mm / 285mm. Blade width at choil: 3mm / 3mm. Blade wiidth 1" from tip: 2.3mm / 2.3mm. Blade height at heel: 48mm / 48mm. Weight: 204g / 178g. Blades: forged-to-shape differentially heat treated 1095 carbon steel, etched and polished. 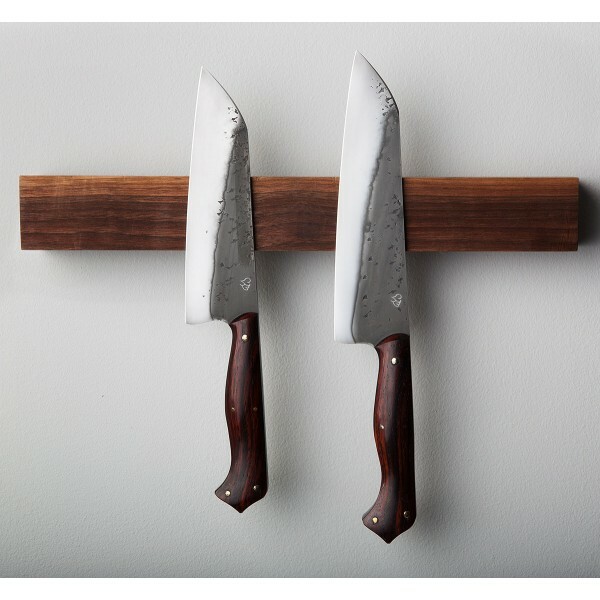 Handles: Old-growth cocobolo with bronze pins.